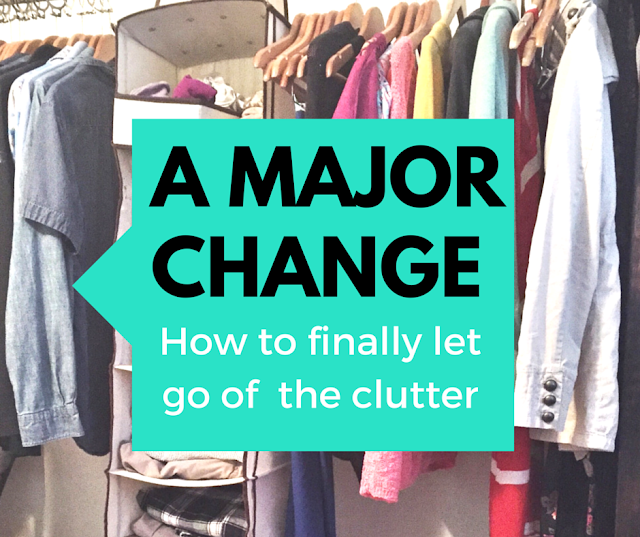 This organization style called the "KonMari Method" ensures that you let go of things with positivity and clarity... you won't find yourself thinking you made some big mistake! Using this method, I was able to let go of 98% of my clothing and feel like I'm NOT MISSING ANYTHING. (No Aunt Beth, I didn't get rid of any of Grandma's hand-me-downs, those are safely packed away!) It's pretty miraculous and freeing. If you decide to buy the book, I want you to know that I make a small commission off purchases made off this blog which helps support my writing and the blog cause. The book is called "The Life Changing Magic of Tidying Up" by Marie Kondo. In her book, Marie Kondo shares a process to eliminate clutter and then goes into great detail about how to fold and organize all your clothes. I tried the "origami" folding style but personally found it to be too mentally taxing to maintain. I want to share with you the parts that worked for me. 1. Extract all your clothes from all corners and crevices of your house. Yes get out ALL of your clothes, and put them in a pile in one place. Yes. THIS IS ALL THE CLOTHES I ONCE OWNED IN A SINGLE PILE. I may be airing my dirty laundry, but at least it's clean NOW! Your giant pile serves a practical purpose. It should shame you into being willing to let go of more! I have collected years of clothes, since my body hasn't changed since middle school, and I also constantly get hand-me downs from my sister. So that's why I had so much. Those are my excuses. :) Nothing to see here folks, on to step 2. 2. Get three boxes or baskets and label them "Donate" - "Sell" - and "Keep"
Here are my three baskets. They will be your allies on this journey. I had basket overflow with each of these, but you have to start somewhere. For selling your clothes, I recommend just doing a garage sale since it's so hard to sell used clothes online, even name brands. I had tried several apps and nothing really worked for me. Don't forget to give friends a "pre-sale" opportunity! The donate pile was my favorite. It's so cool to be creative with your giving instead of just defaulting to Salvation Army. They're great and all, but why not cut out the middleman and go straight to a local organization that really needs it! You definitely know someone who knows someone... I only sold a small portion of my clothes but it felt great to donate to my friend's cause, called Hope On a Mission, which is a street ministry in my local city that helps at-risk homeless women get food, clothing, and hope! 3. Go through each article of clothing INDIVIDUALLY, hold it in your hands, give it your full attention and ask yourself "does this spark joy?" This is where you have to be painfully honest with yourself. Like me, you may find this to be emotional and deeply disappointing, realizing how much you've accumulated that means absolutely nothing to you. But it's so worth it, because you get to let go with joy and gratitude. It's not perfect, but it's my new normal - and so much more sane. All my clothes now fit on HALF of a single metal garment rack from Target. It's so much neater that we actually keep it outside of a closet. My husband and I share this center portion which is a hanging closet organizer like this one where folded clothes are kept, and I keep PJ's and undergarments in two neat boxes stacked on the floor. If you want to learn more about the Japanese KonMari method, and how you can apply it to other areas of your life, including home decor, kitchen, and even your online life, the book is right here! I think you'll love it. Spring may be almost over, but tidying is a constant effort and it really helps to have solid tools to make the right choices to work toward a simpler life. I hope this post encourages you to simplify! It's possible to let go of so much of the stuff that weighs you down and still feel like you're totally abundant, happy, and free.